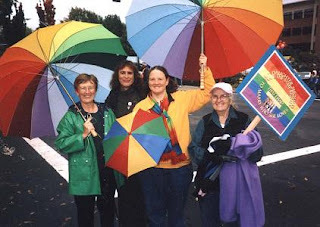 A (rather small) contingent of PFLAG volunteers showed up in the rain for the Eugene Celebration parade. What we lacked in numbers, though, we made up in visibility. We're known for the rainbow umbrellas we sell as a fundariser, so we walked the parade route with these and a banner. It was startling to hear such applause -- people standing up from their blanket-wrapped lawn chairs to clap and shout "Yay PFLAG!" I cried the whole way, and dropped a smiling curtsy from time to time through the proud and happy tears. I have two counselors now, which is what it takes to get surgery with my surgeon: a letter from one, with a doctorate, and a letter from another, which basically says, "yeah, the other shrink is right, she needs the operation." They've basically told me, yes, this is going to happen, so I sent my deposit to Dr. Harold Reed and told my doctor's office to send him my medical history. One feature of all this activity is that it is now time for me to begin what we euphemistically call "south pole work." That is, electrolysis of the genital area. Hair needs to be gone from everything that will be inverted or become labia, a month before the surgery date. So I asked my electrologist about this. "Yeah -- I do that." "I'm, uh, not shy, but, umm, I worry. I mean, I get pretty jumpy when you do my eyebrows or upper lip." "Well, what you do is, you get your doctor to prescribe you some EMLA. Put in on the target area in quantity about an hour before you come in, and cover everything up with plastic wrap. it won't be too bad." So I got the EMLA and took it to work with me, and went to the ladies' room an hour before going to see her, and did -- I hoped -- apply liberally. For the first few minutes, it wasn't so bad. Then she shot a hair and it lifted me right off the table. "Maybe we'd better do face." "Umm, up till that point we were, um, okay; maybe there's are some spots I covered better than others?" "Sure, I'll try here." BZZZT. "How was that?" "Uhh, way better. I can go with that." BZZZT. "What it is, is, you didn't put on enough." BZZZT. "I said in quantity." BZZZT. We lasted forty-five minutes, then moved to face work. This week, I went to see my new backup counselor, which went very well, then ran to the ladies' room, slathered on EMLA like there's no tomorrow, and drove out the the small town where my electrologist lives, on a lovely hill in the country. "Didya use enough?" she asked. She's, like me, an old-fashioned country girl. What she says goes! I could see her sheep grazing out the back window. I know she can do her own lambing and shearing, so she's apt to be very no-nonsense. "Hope so," I said. In fact, so far as I could tell, I was completely desensitized from hip to hip -- Dr. Reed could go ahead and operate -- the entire Green Bay Packers could kick me there -- All Quiet on the Southern Front. BZZZT. Didn't feel a thing. Yay! BZZZT. But five minutes later, I could tell what she was doing. Five minutes after that, I began strangling the hanky that, for some reason, I had in my hands. Ten minutes after that, I began counting the blossoms on a flower-print ceiling hanging that she has -- 1,028 forget-me-nots. Ten minutes after that, beads of sweat formed on my upper lip and eyelids. I had been living in a cabin on a farm where I worked, away from the main house, and one night, about two in the morning, something fell across my face and woke me up. I reached up tentatively and felt the object in the dark. It was a human hand. Sheer dread, coupled with a little nausea, attended my further investigations. There was a naked forearm attached to the hand. I found the elbow -- here the arm took a right-angle turn -- I continued feeling my way up the arm till it came to my shoulder. My own left arm had fallen "asleep" on the edge of the cot and as I rolled over it had slapped me with all the strength of a falling dead weight. I told her this story and she thought about it a bit -- BZZZT -- and then sat back, took off her magnifiers and started giggling. As soon as she did, so did I, and we guffawed, snorted and whooped for about three minutes. We had to move the clock. "Heh, heh. Heh, heh, heh." BZZZT. Finally -- she shot a hair and it lifted me right off the table. She looked at the clock. "Well, it has worn off, I reckon; we've gone fifty-nine minutes. You want to call it a day?" As I made myself presentable, she remarked, "I'm glad they don't need any more taken off than they do -- that's always a hard angle for me, because this is my only table." "Do people sometimes need more?" "Well, not for the operation. I get people who, for reasons of their own, want it all done. I tell em, 'let's do the bikini line first, then we'll talk about the rest of it." Since I can only afford an hour a week, we'll start alternating bottom and face work until we're done with the bottom. That's fifty dollars a week, in case any of you are wondering why I haven't bought you any presents lately.